Today’s competitive business landscape drives rapid product innovation, and in turn makes it critical for organizations to have the right technology solutions in place so they are ready for future market needs. Company leaders or stakeholders often wonder how short and long term business goals can be matched to a specific technology— all while keeping costs and risks low. One answer is the technology roadmap and roadmapping process. In the 1970s, Motorola created the process of technology roadmapping. Since then, companies around the world have turned to technology roadmapping to drive complex projects. Robert Galvin, Motorola’s former chair of the board, has repeatedly stated that roadmaps are designed to communicate visions, attract resources from business and government, stimulate investigations, and monitor progress. Technology roadmaps are complex and have many nuances. This piece takes an in-depth look at the technology roadmapping process, and explains how to gain executive approval and support of your technology roadmap. Additionally, you’ll hear from experts who provide advice on overcoming potential roadblocks. Discover additional best practice tips, templates, and more in our Technology Resource Center. Who Benefits From Technology Roadmapping? What Should a Technology Roadmap Include? What is the current state of all technology across the entire organization? Are the right technologies in place to support the organization’s core capabilities as well as its critical business functions should the organization experience an unanticipated disruption? Is there different technology supporting similar capabilities within the organization that can be leveraged? Roadmapping is a collaborative effort that typically involves engineering, development, and technology teams. Input from third-party stakeholders who will use the systems also often participate in the initial and final roadmapping stages to help ensure usability. However, every organization has different types of stakeholders, and each stakeholder brings different concerns and expectations. For instance, chief information officers (CIOs) usually care more about strategic plans and whether or not their technology choice will help them achieve their strategic business goals. By contrast, data center architects want to know about the infrastructure of emerging technology. However, IT roadmaps serve a range of stakeholders, especially in large enterprises where technology systems can be complex. CEOs, product managers, and project teams are among many key stakeholders that can benefit from a technology roadmap. While taxonomy and processes vary across industries, there are two main categories of technology roadmaps used by large enterprise environments: the product technology roadmap and the emerging technology roadmap. The product technology roadmap is driven by the product’s needs. It helps IT executives identify which technologies can improve a product’s functions or extend the use of that particular technology. By contrast, the emerging technology roadmap focuses on forecasting and decision making around the development of a single product in the infancy stage. The implication with these emergent maps is that as the technology develops, so will the uses for it. To create a successful roadmap, you must have deep contextual knowledge of the area. For instance, if your IT roadmap is for a commercial banking business, then you will need to understand the systems and processes within commercial banking. Otherwise, you cannot effectively determine the needs. Additionally, past experience in roadmapping is helpful. However, if you have worked as a project manager, product manager, program manager or business analyst, you probably already have developed skills to gather and organize large volumes of technical data. In fact, those with significant experience as a facilitator, consultant, or corporate trainer will likely adapt well to the roadmapping role because throughout the process you’ll engage in numerous discussions with stakeholders. Ultimately, the key indicator of successful roadmapping is the ability to interpret technological information and communicate it clearly to non-technical audiences, as well as to top-level executives who won’t be afraid to ask tough questions. IT roadmaps offer a wide range of flexibility. There are no set standards for what TRMs must include, so it’s important that you remain mindful of the particular needs for your business. Below are core elements that technology experts suggest your roadmap includes. Focus on key priorities: “Roadmaps are not lists! I can’t tell you how many roadmaps I’ve opened only to see a wish list of activities,” blogs Ross Brindle, CEO of Nexight Group. With technology constantly evolving along with the challenge of planning for the future, it’s easy to see how IT roadmaps can go sideways. By communicating through your roadmap that you know why, what, how, and that you have an action plan, you stay connected to your business strategy and maintain a sense of key priorities, even when you’re presented with new information. Gather input from suppliers: “The beauty of the Roadmap is that it allows for a larger perspective on technologies,” states John Carter, author of Innovate Products Faster. This emphasizes the importance of making the roadmap a collaborative process. According to Carter, a technology roadmap is more robust when it includes perspectives from business partners and suppliers. He suggests spending time outside of the office developing technology partners as that is how you establish a true sense of the competitive landscape and how you can discover technology alternatives that can help you improve your company business positioning. Casey Kopp has helped many Fortune 100 companies in the cloud computing, financial services, and hospitality industries analyze their processes and implement process improvement initiatives. He recommends that every organization create an IT roadmap. “Having a functional roadmap does more than help you build for future needs, it helps you respond more easily when new issues arise because the roadmap gives you a true sense of your portfolio and its current state,” Kopp says. State your mission: “Your IT roadmap should have a blatant mission statement that conveys the strategy for the roadmap,” states Kopp. This usually comes from the CEO, CIO, or CMO in the form of an initiative list—which can be extrapolated into a mission statement. When you have a mission statement you help everyone involved understand the overall goals. Create a tactical list and prioritize it: These tactics directly relate to the goal(s) outlined in the mission statement. Tactics are generally high-level initiatives; each tactic should have a timeline associated with it, and be comprised of smaller tasks or jobs (also with timelines) that can be assigned to an owner. Pair your tactics to a budget (or cost estimation) and a business case. “Many times this step will help determine the priority and serve as a checkpoint if priorities shift,” says Kopp. How does it tie back to our objectives? Despite the value that IT roadmaps can provide, there are some potential challenges. Below is a list of common problems teams face when creating a roadmap so that you can be aware of the drawbacks before you get started. Alienating stakeholders: “A particular challenge I come across when organizations move forward with creating a technology roadmap is that stakeholders haven’t been engaged,” states Michelle Nessman, Founder and President of Elite Business Systems. Without early buy-in, you may find yourself hunting for and chasing after stakeholders in order to get necessary approvals. Setting aside priorities: Nessman also noted that when priorities are ignored or go without monitoring, budgets become impacted—often with overruns. “Many companies have started shifting to having a technology committee,” says Nessman. This eliminates the ‘IT only’ perspective and prevents decisions being made to favor the concerns of IT teams. Inaccurate or fragmented information: If the system data is not accurate or complete, the quality of your roadmap declines. You can avoid credibility issues by diligently reviewing your system data before you begin roadmapping. If your organization has subject matter experts, tap into their expertise. If not, seek out industry analysts, suppliers, or the help of consultants. Keep in mind technology roadmaps are packed with detail. Additionally, the mission statement, business strategy, technologies, priorities, activities, and timelines should all link. Understanding these challenges will help you overcome them when creating your own IT roadmap - rather than backtracking when the process becomes unmanageable. As mentioned, there’s no true, set-in-stone format for building IT roadmaps. However, there are several software tools that can help you get started creating and managing your roadmap. Here are some for you to explore. 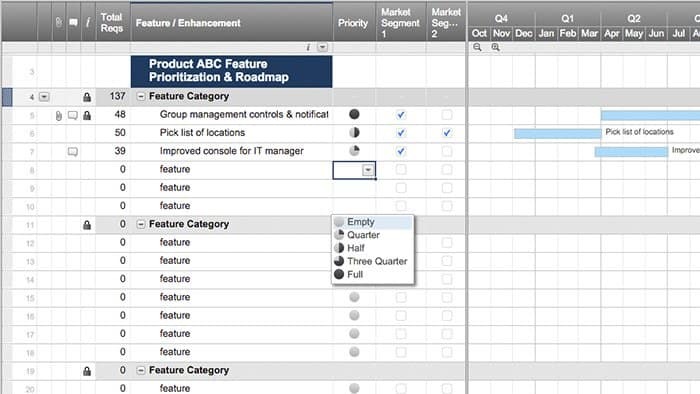 Product Plan helps you build technology roadmaps and prioritize your initiatives. Use one of their many templates to help you get started, including tailored technology roadmaps for enterprise or IT architecture. Roadmunk offers spreadsheet templates that guide you through data fields as well as rich featured presentation software. Excel also offers several roadmapping templates, such as the “Technology Roadmap” template, that you can use to store all project information in a familiar spreadsheet layout. Smartsheet is a cloud-based work management tool that offers free technology roadmap templates. Smartsheet is a spreadsheet-inspired work management tool with robust collaboration and communication features. You can also use the cloud-based platform to create a technology roadmap, and store all project information in one easy-to-use, anywhere access sheet. In fact, Smartsheet has a variety of pre-built templates that you can use to get started. 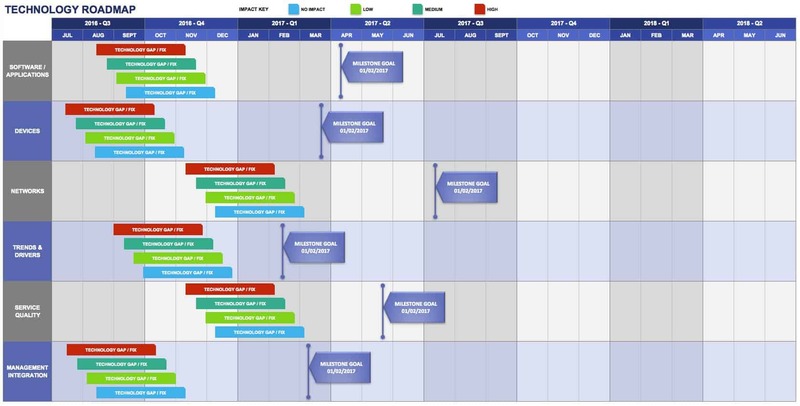 Use the “Feature Prioritization and Roadmap with Gantt” template to organize all future product features by priority and track the status of each task. Additionally, analyze feature priorities by category, market weight, or number of requests to determine the most pressing releases. The built-in Gantt chart allows you to visualize timing, identify dependencies, and assess tradeoffs, and physically drag the Gantt bars to reflect delivery changes. Attach relevant documents directly to rows in your sheet, and communicate with team members using Comments. Share your roadmap with an infinite number of external stakeholders, and adjust the sharing permissions as necessary. You can also apply conditional formatting to highlight at-risk tasks and set automatic alerts to ensure that nothing gets overlooked. 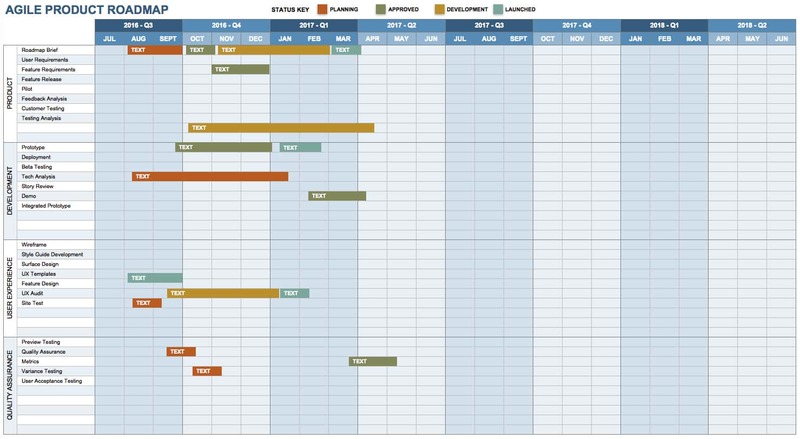 Finally, customize your sheet with color and symbols to tailor your roadmap to fit your project’s needs. Enjoy these features on Smartsheet’s mobile app, and get anytime, anywhere access with this cloud-based app. Discover a more collaborative technology roadmap with Smartsheet.